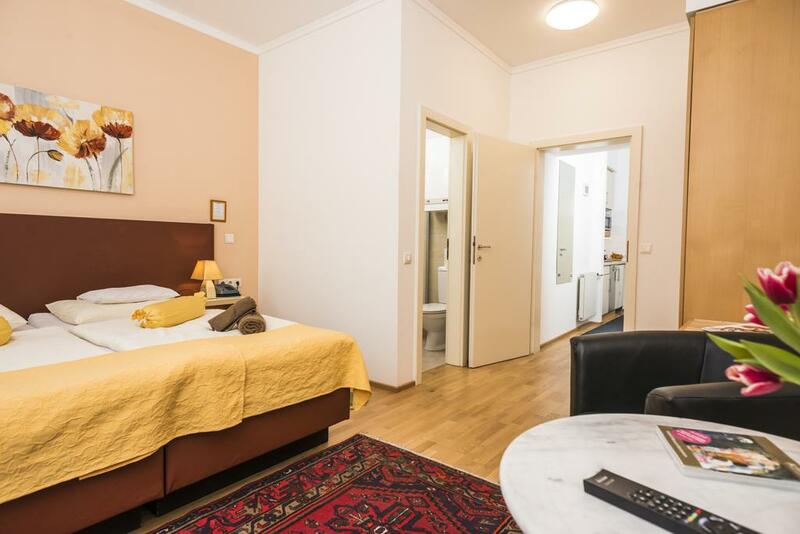 The Superior Ferchergasse Studio Apartment is a spacious apartment on the second floor and is fully furnished. The 40m² apartment has a bedroom with a large double bed or two single beds and two lounge chairs. The fully-fitted kitchen and the bathroom are separated from the bedroom. 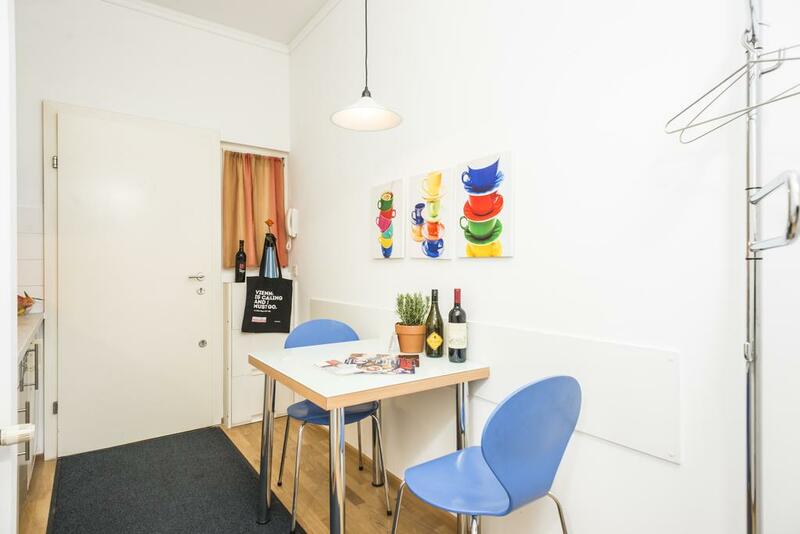 This apartment offers everything you need for a comfortable stay in Vienna. 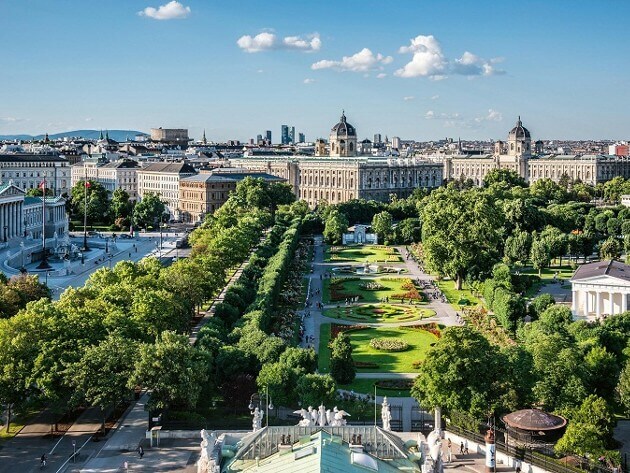 From our location in Hernals you can easily reach the city center, Schönbrunn Palace and many sights of interest, thanks to the efficacy of local public transport. Since Vienna has so many facets to discover we are available for all your questions at any time. 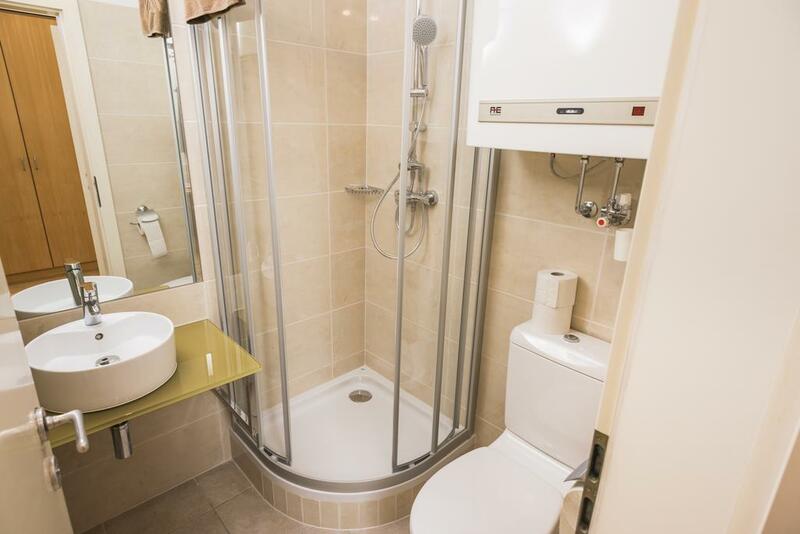 The Superior Ferchergasse Studio Apartment 6 features a private bathroom with a shower, free WiFi and private parking that is possible on site (reservation is needed and costs 12 € per day). In the bedroom you can choose between 2 single beds or 1 large double bed. In the separated part of the apartment there is an integrated fully-fitted kitchen, so that you can prepare your own meals if you wish. The apartment is suitable for up to 2 people. 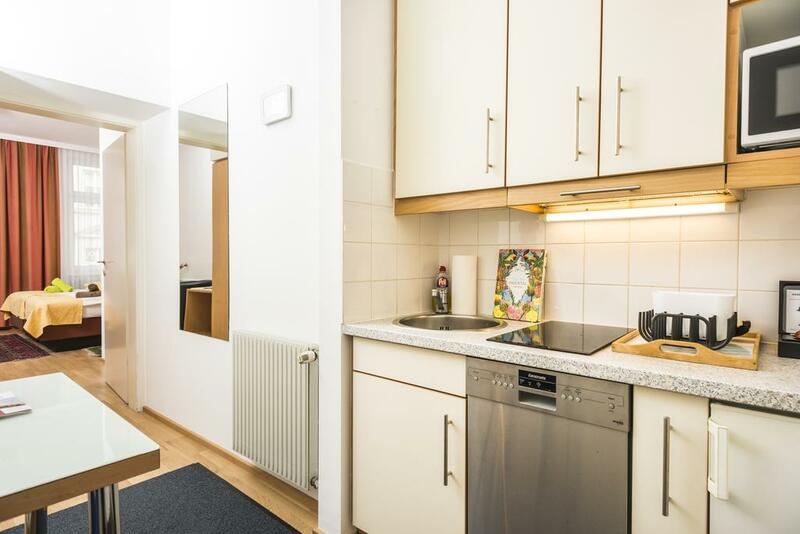 Located in a peaceful residential area in Vienna’s 17th district, Apartments Ferchergasse offer modern accommodation in numerous buildings, each of them with a fully equipped kitchen and free WiFi. All of the self-catered apartments at Ferchergasse feature spacious living rooms, satellite TV and modern bathrooms. They also include a dining area. A washing machine is at the guests’ disposal as well. All of our apartments are non-smoking. You can smoke outside, in the inner courtyard where we have nice garden furniture to use. You can walk to the nearest tram station in just a couple of minutes and take the tram nr. 43 which will take you to Vienna’s central Schottentor station in just about 15 minutes. From here you can walk through the city’s historical centre and reach St. Stephen’s Cathedral in about 15 minutes. Schönbrunn Castle can be reached by bus nr. 10A which is 200 m from the apartment. We can also arrange an airport shuttle service for our guests for an additional fee from/to Vienna’s International Airport, which is only a 35-minute drive away. All of our apartments are non-smoking. You can smoke in the inner courtyard where we offer our guests nice garden furniture to use. You can add the extra item called "Baby cot on request for free" during the reservation process if you require a baby cot. Pets are allowed on request in advance (inquiry). For pets we charge 15 € per day. You can add the extra item "Pets 15 €/day" during the reservation if you want to bring your pet. Private parking is possible on site (reservation is needed) and costs 15 € per day. You can use the extra item "Private parking 15 €/day" if you want to reserve a parking place. We can also arrange an airport shuttle service for our guests for an additional fee from/to Vienna’s International Airport, which is only a 35-minute drive away (Inquiry needed). You can use extra item "Private parking 15 €/day" if you want to reserve a parking place. Parking on the street is subject to a charge from Monday to Friday (on working days) 9:00 - 19:00 hours. In this period a maximum parking time of 3 hours with a valid parking ticket (6.30 €) is possible. To book this apartment, a prepayment of 100% of the total price is required. Cancellation is possible up to 30 days prior to arrival date and if made within this time period, the prepayment will be refunded. 2 people - Weekend - 92 €. 2 people - 98 €. 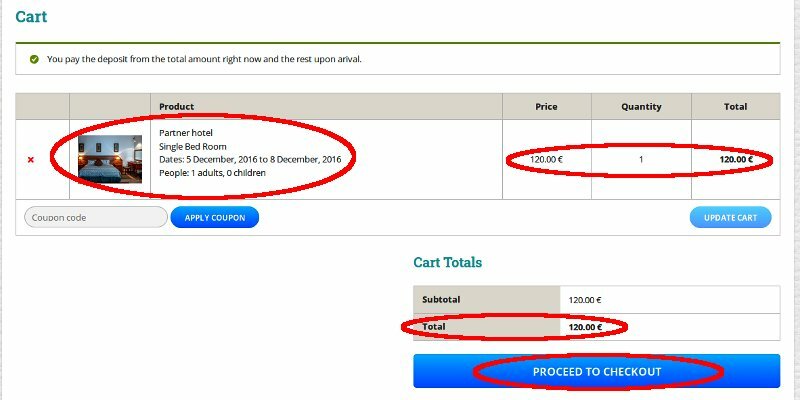 Add this item during the reservation process to let the accommodation owner know that you have requested a baby cot. You can use this extra item if you want to reserve parking place for 12 €/day during your stay. You can add this extra item for 12 €/day if you want to bring your pet. Accommodation booking with Destinelo is quick and easy. You can use the main search bar to quickly find your place to stay on your travels. Choose your desired location and click on the “Search” button. If you want more relevant search results, also choose your check in and check-out dates in the main search bar. Our search engine will quickly find a list of appropriate accommodations for you to choose from. On the next page, if you want even more relevant search results you can use the “Refine search results” tab in the left sidebar to tweak your search. Choose accommodation and click the “Book now” button to enter the accommodation page. 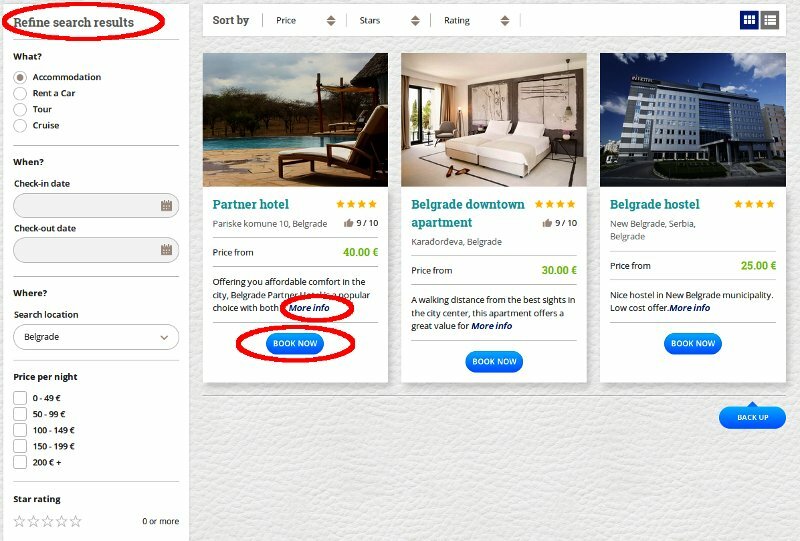 When you are inside the accommodation page, choose the “Availability” tab and decide what room you want to book (if the accommodation has rooms). Click on the “Select dates” button to see availability for a particular room. 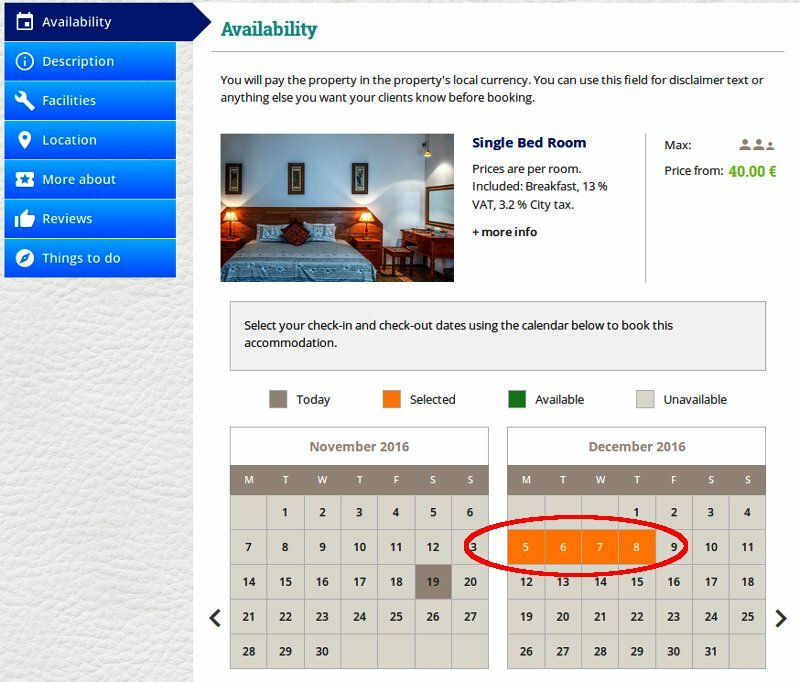 In case of accommodation that is not room based, (like an apartment, house or villa), the availability calendar will immediately appear. In the availability calendar click on the first date for your check in and the second date for your check out. Scroll down to check some other options if needed (in certain cases additional services are provided that can be booked simultaneously) or to see the price breakdown. If you are satisfied click on the “Proceed” button. You will be taken to the Cart page after that. 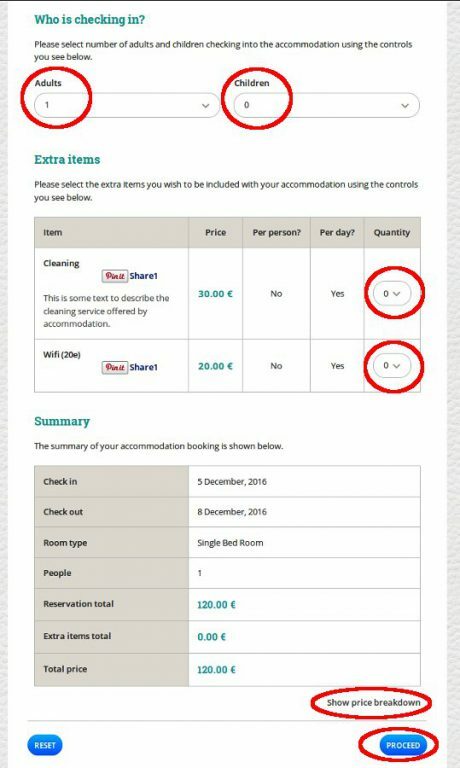 Here you can review your reservation info, accommodation name and room, number of people, price and total price. The “Proceed to checkout” button will take you to Checkout which is the next page. 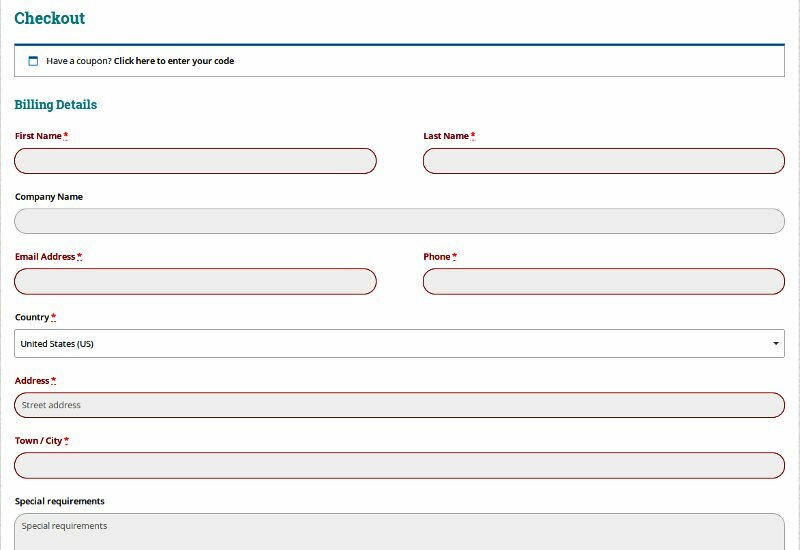 The final step is to fill in your personal information which is necessary to make a reservation. We will send your information to the accommodation owner (for reservation purposes). You pay the deposit right away and the rest upon arrival on location. 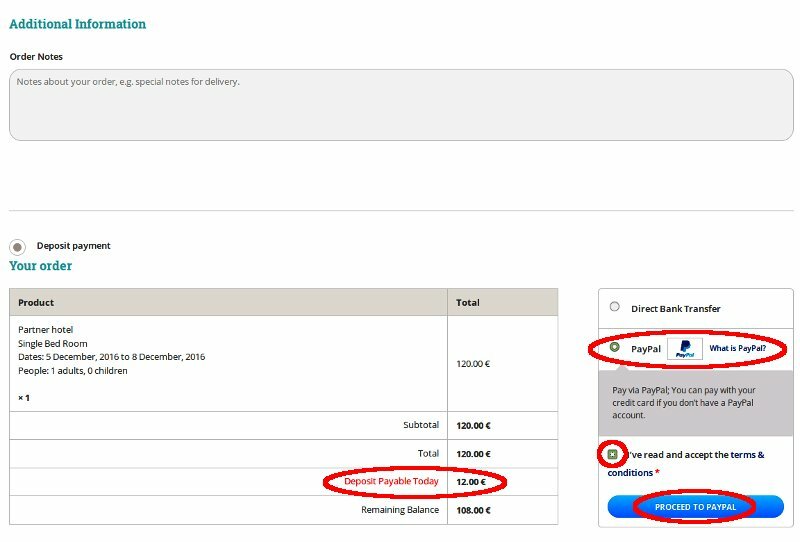 Choose the desired option for payment, check the option “Accept the Terms and Conditions” and click on “Proceed to Paypal” button (or any other payment gateway of your choice) to finish the payment and booking. You will be redirected to Paypal (or another payment option of your choice) to finish the payment on their secure website (or offline, in case of a bank transfer). *You can always check our Terms and Conditions page if needed. Congratulations! You have successfully booked accommodation on Destinelo. If you want to cancel or change an existing reservation, please contact us. In the email, kindly indicate the order number of your reservation. It can be found in the subject line of the email confirmations you had received from us.